Never before has the power of technology been more important to a company’s long-term success. Technology is providing a digital infrastructure for efficient processes, deepening customer relationships, and transforming business-as-usual into a dynamic, mobile and interactive experience. The IT leaders of today champion technology’s role in the enterprise and strive to enhance the organization’s profitability and productivity. Are you equipped to discover that key strategic insight deep in the sea of data and information washing over your team on a daily basis? Are you equipped to confidently and clearly communicate your strategic insights to the CEO to gain the resources you need to favorably position the company in the competitive landscape? Are you equipped to set strategic direction by clearly outlining your goals, objectives, strategies and tactics and align them with the rest of the organization? The answers to these questions can make or break your company and your career. There are three advanced disciplines of strategic thinking that your team can develop to enhance your ability to fuse technology and strategy into viable innovations that lead to competitive advantage. The first discipline is the ability to coalesce, or bring together, people and their insights on a regular basis. Too often, strategy is a contrived annual event that manifests itself in a monstrous PowerPoint slide deck with no new thinking. The lack of strategic insights and true innovation in the plan renders it obsolete the moment it’s finished and is the reason so few people actually use the plan to drive their daily activities. The second discipline is the ability to compete, or transform your strategic insights into competitive advantage. Competitive advantage emerges because a company is able to provide superior value to customers. In my research with several hundred IT leaders, one of the main challenges they expressed was the fact that they become so “task-oriented” that they commonly lose sight of how their initiative is helping the organization deliver value. Instead of focusing on achieving goals, they become consumed with what sometimes devolves into activity for activity’s sake. An IT leader needs to have at their disposal tools and techniques for analyzing the competition and determining where distinct value resides in their value chain. Only then can they design strategies that drive superior value. 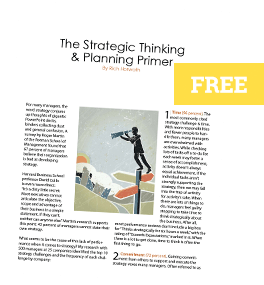 The third and final discipline of advanced strategic thinking is the ability to champion your strategic initiatives throughout the organization. Packaging one’s strategy in a slick, graphics-infused slide deck and expecting the rest of the organization to immediately execute it is wishful thinking. The ability to champion strategy includes a leader’s understanding of how to influence without authority across functional areas and levels, to align priorities and gain commitment. It also requires the knowledge of how to create the appropriate actions and behaviors that lead to long-term strategy habits that sustain success. IT leaders increasingly understand that strategic thinking is no longer a “nice-to-have” skill. While it may be comfortable to stay in the warmth of your technical expertise, the great IT leaders realize it’s their team’s ability to think strategically–identify market trends, understand customer needs, differentiate from competitors, and set strategic direction–that will play a significant role in their level of contribution and success. A CIO Executive Council study found that the number of CIOs who were able to become “strategically-oriented game-changers” has doubled in three years from 12 percent to 25 percent. Are you and your team in that elite group?